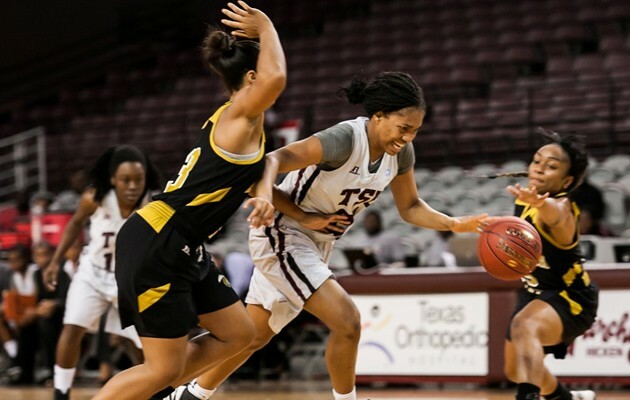 BIRMINGHAM – The Southwestern Athletic Conference has selected Texas Southern University guard, Te’era Williams, as its SWAC Women’s Basketball Player of the Week. Williams earns her second player of the week honor on the season after sharing the title with Alabama A&M’s Jasmine Sanders on January 23. Williams, a native of Oklahoma City, Okla., helped lead TSU (16-9, 13-1) to a pair of conference wins while stretching its win streak to 13 games. She averaged 16 points, 4.5 rebounds, and 5.5 assists during the week. She also shot 40 percent (11-19) from the floor. To open a back-to-back home stand, Williams scored 12 points and hit a crucial free throw in the final seconds to help TSU hold off Arkansas-Pine Bluff, 63-59 (Feb. 16). She also recorded three rebounds, six assists, two blocks and three steals in the win. Williams capped the week with a 20-point performance to push the Lady Tigers to an 84-71 (Feb. 18) win. She hit all 10 free-throw attempts and hauled in six rebounds. In addition, she tallied five assists and two steals.